The Indian Ocean tsunami 2004 was estimated to cause more than 250,000 deaths and countless casualties. Although Aceh, which is in the most western part of Indonesia, has experienced numerous destructive tsunamis in recent history, when the 2004 tsunami struck, it led to devastating damage and human casualties. It seems, then, that 2004 tsunami happened regardless of any lesson learnt from past similar events. Information is the most important issue in Disaster Risk Reduction (DRR). The purpose of this study; to collecting data to pre and post tsunami 2004; to displaying attractively multimedia data for young generation; to build local community for continuing DRR activities and sharing global information. The study areas of this study are sixth districts disaster affected area along the western coastal of Aceh. The method of this study: The first method is anthropological approach to collecting data by primary data collection from questionnaires and in-depth interviews and secondary data from previous research: The second method is technological approach to display multimedia data including making film and into develop digital archive to visualizing digital earth contents and linked comparison study between Japan and Indonesia: The third method is social approach to build community base DRR for sustainability disaster prevention education. We survey the precedent cases of related disaster digital archive construction and related studies to evaluate them. We prove the effectiveness of the use of open source software and the necessity of multimedia display. Chapter 1, discusses the general content of the research. Chapter 2, discusses the previous study and relative study of the research. Chapter 3, discusses the general method, evaluation and the result of the research. 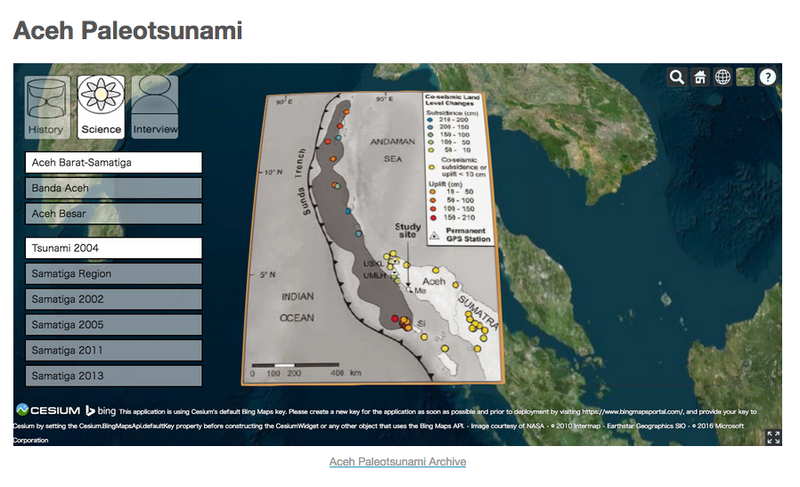 Chapter 4, we develop a pluralistic digital archive by data collection of scientific - geological records, historical manuscripts related to earthquake - tsunami and interviews related local knowledge from past disasters. Developing method is mash-uping whole digitalized data into a digital earth interface for to display all materials at glance and to facilitate the cross referencing with landscape. And also, we conducted a comparative experiment to measure user’s learning level by using original materials and the digital archive. Based on the results of the experiment, we concluded that our method displayed better of knowledge to fill in the gap information from the past disaster for a young generation. Chapter 5, we use film as multimedia for DRR education, which is needed to fill in the gap information from past disasters. Film is an effective medium to transfer knowledge of past disaster. The film is produced with a method to record in the two different locations and merge them into one film. First location is the scenes took in the laboratory to explain of a researcher’s theory to know the age of tsunami deposit using carbon dating. And second location is, the scenes took in the tsunami affected areas to know local knowledge. We uploaded it to YouTube for viewing by a wide range people all over the world and local people. And also, the film was selected as permanent exhibition display in a public tsunami education museum. We evaluate this situation as a good starting point to transfer knowledge. Chapter 6, we use virtual disaster heritage because any major catastrophe will leave many relics, it seems to be important to sustainable disaster education for global community. Data collections of tsunami survivor’s testimonies are important to preserve the heritage of disaster and it serve as a Dark Tourism attraction. To accomplish this purpose, we visualized the data by using method described in Chapter 3. The archive shows the place of historical context of testimonies. To shows the other benefit of disaster heritage, we conducted survey in the disaster site, the heritage of disaster does not only include sorrow, but disaster education and improved the economics of communities surrounding historical sites. Its serve as a lesson for other disaster areas such as Japan, where many disaster relics has removed. Chapter 7, we visualize data of Aceh rehabilitation and reconstruction from German Red Cross Housing Project in Aceh. 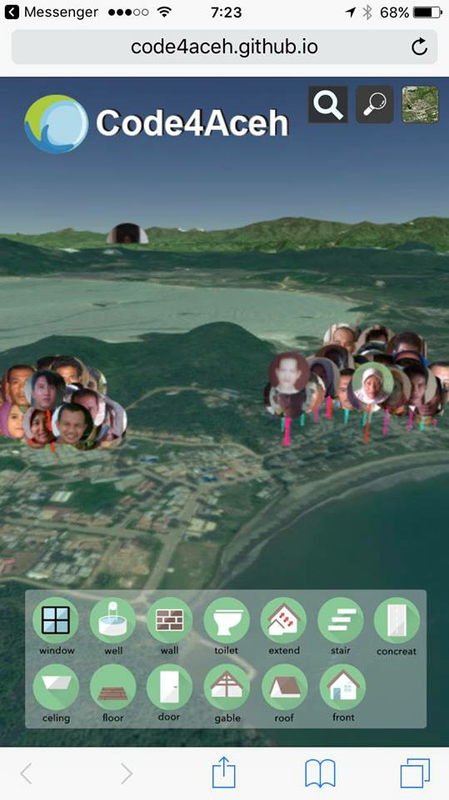 Data collection of tsunami victims and housing’s photos are important to compare the landscape area of the housing location and its effects on damages and significant changes of housing condition. To accomplish this purpose, we visualized the data by using method described in Chapter 3. We analyse the data using this visualization and revealed the fact that building structures increased community disaster preparedness and enhancing economic growth. Base on the visualization data on the housing reconstruction process proved to be an effective way to document the lessons learned and disaster risk reduction for future use. Chapter 8, we establish an online / offline community for to understand the threats within their territories, make efforts to share experiences, and mitigation strategies by-from-for the community for sharing global information of DRR. To achieve this purpose, we hold an annual workshop series and create social networks to engage, sharing, and spreading the knowledge. At the moment, the community has cited publications in online and printed media of local to international scale. 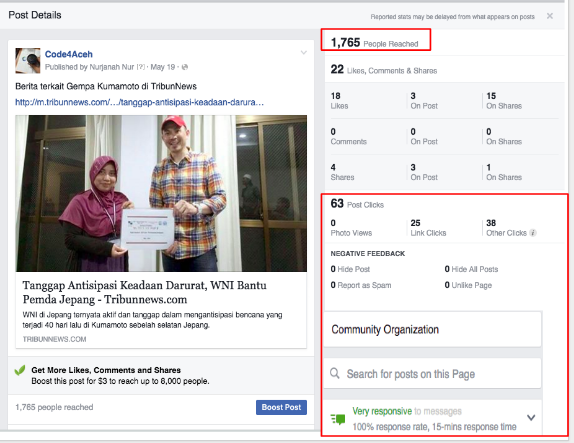 And according to analysis of users’ behaviour, it is proved that the community has had a positive impact and attracted positive attention from audiences, more than 1,700 people reach the link and the information was spread up. From these results, we evaluate that the community is continuously growing up. Chapter 9, we compare tsunami disaster studies of Japan and Indonesia, to get a mutual understanding of the disaster experiences and practices between the two countries. The method is comparison of the pattern of evacuation during disaster, between Great East Japan Earthquake (GEJE) experiences and Aceh Earthquake on April 11, 2012. We use the same method described in Chapter 3. As lesson to learn of GEJE 2011 resulting people used escape building that has been designated for evacuation, but the tsunami is greater than predicted and many people died because of it. After the Indian Ocean tsunami 2004, on Aceh Earthquake 2012, the people of Aceh had a stronger intuition to save themselves to a higher place in the event of a major earthquake than evacuate to the escape building. Both experiences had compare and invaluable as global knowledge for DRR. Chapter 10, we hold a workshop with local students participants to evaluate the archive, to test its attractiveness and its ability to inform young people about the past historical disaster. We set two steps in the workshop program, first step is using ordinary medias and second step is studying by our application. The result of questionnaire, it is proved that the archive had function of alternative media to get knowledge, lesson learn and sharing information as contribution for sustainability DRR and global information by a handy tools. As overall conclusion, based on the result of each chapter are as follows: We have contributed to anthropological data collection related to past disasters. 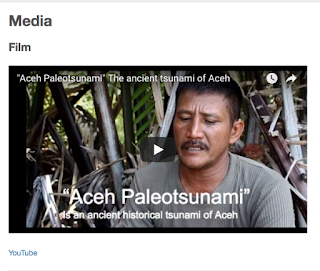 We proved that our digital archive method is attractively digital earth interface to display multimedia data including film and comparison study between Japan and Indonesia. And we established a DRR-based community as a better function to transfer information about disasters more accessible to the younger generation, especially by connecting them to the SNS. 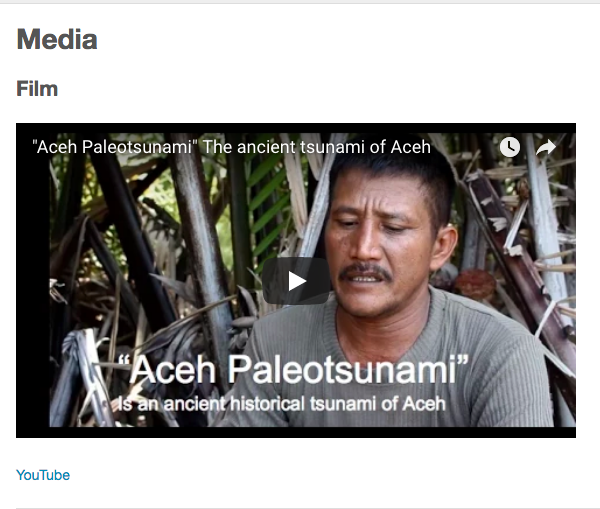 The pluralistic disaster digital archive will remind people around the world that local knowledge from the past disaster offers invaluable lesson for DRR and global information. And my perceptions for the future student who really want to study PhD (or others) in Japan. First, if you apply for PhD, make it sure that you already apply scholarship program before come, it is for your financial secure (whatever the story is). Then you have to prepare yourself for the most uncomfortable situation will you face. Read more about the culture’s background of Japan. How’s their life, their food, their passion etc. But it isn’t enough, you might have to consultation to the people who had experience about it. And when you are study in Japan and got bad situation with your friends, your colleagues, administration things, just talk and discuss to your supervisor. Even if the biggest of your problem is your supervisor itself, sometimes they didn’t notice and understand what the problem is. Discuss it with the properly ways, honestly and do your best. Reassure your supervisor that your study is a collaboration work. Prove it that you have value to help your supervisor and need his guiding too, to finishing your task and study. It is the hardest part of being PhD Student. But it is the only one and best way, while staying patient, keep calm and doing the best progress. Gather with your best friends and visiting religious events sometimes healing your soul.